What does it take to ensure the largest ferry terminal of the largest ferry system in the United States can stand up to a major seismic event? It takes a great big pile of…piles! Almost 500 steel, seismic-grade pilings, to be exact. Not a small number, but it’s only a fraction of the 2,000 or so timber beams currently holding up today’s Colman Dock terminal building and much of the existing dock on the Seattle waterfront. 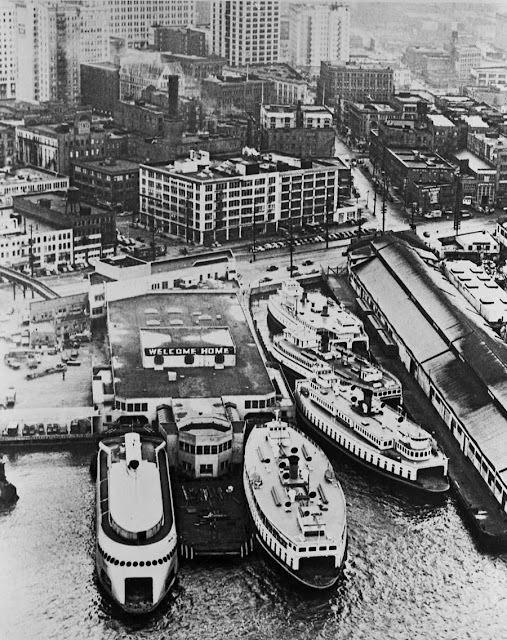 Back in 1936, Puget Sound Navigation Company rebuilt the terminal building in an Art Deco style to match the company’s newest flagship vessel, the Kalakala. At the same time, they restored the dock by replacing the original 1910 wooden pilings with timber piles bathed in creosote to prevent deterioration. 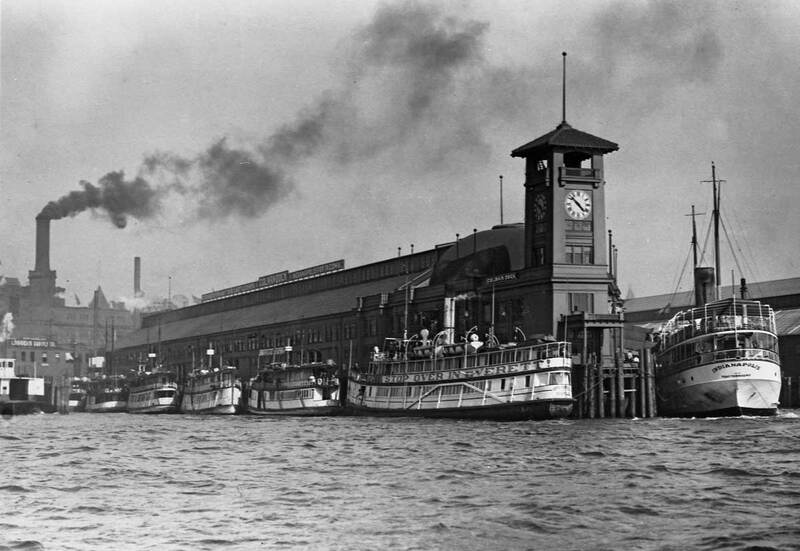 The state’s minimum wage was 25 cents when Colman Dock got its first complete makeover. The “Welcome Home” sign was added after the end of World War II. Photo courtesy of Paul Dorpat. 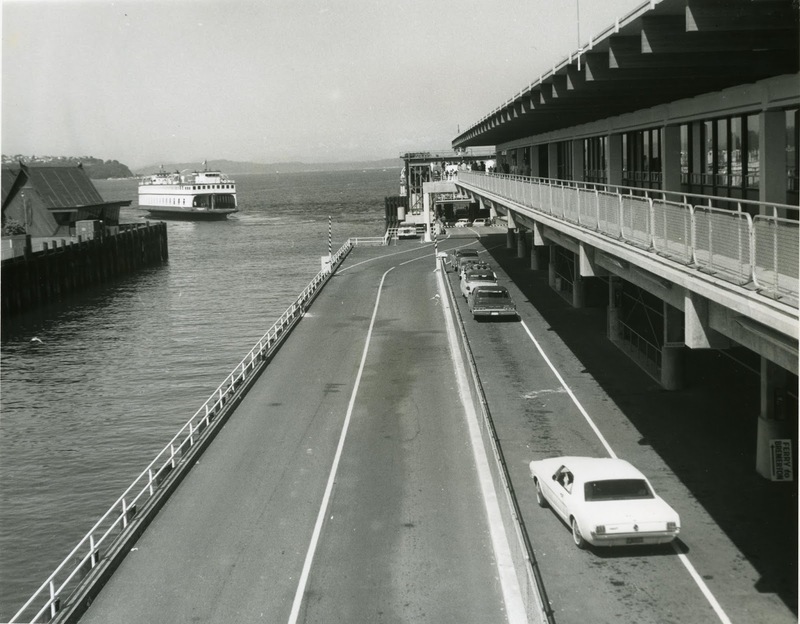 The new, Modernist-style Seattle ferry terminal, dedicated on May 18, 1966. 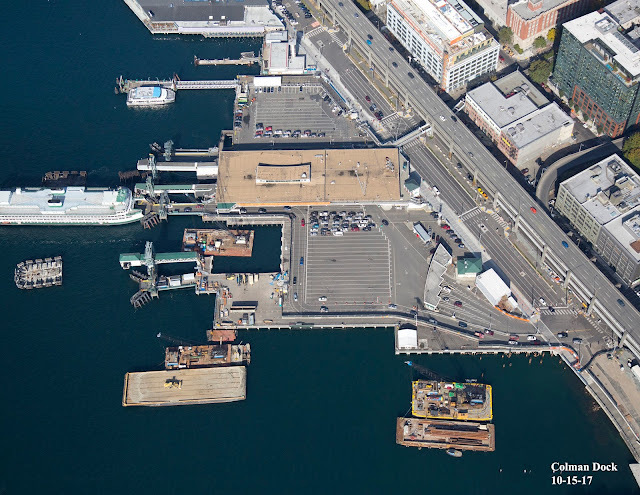 The Seattle waterfront’s busiest bevy of berths underwent another modern upgrade in 1966, however this Mod style terminal building was built atop the same pre-war creosote timber foundation as its predecessor. The terminal building at Colman Dock underwent a few more upgrades during the 1980s and ‘90s. In 1990, we expanded the concrete trestle dock south of the terminal building where the Bremerton vehicle holding area is today. But, back to piling on the piles. How is it possible to replace thousands of timber columns with only 500 steel tubes? You could say we’re doing more with less. The Seattle Multimodal Terminal at Colman Dock Project replaces the existing timber trestle with a concrete and steel trestle, so that we can continue to provide safe and reliable ferry service to millions of people across the region. Each massive steel pile is up to 3 feet wide and 150 feet long. That means one steel pile can cover the same amount of ground as three or more old wooden piles. 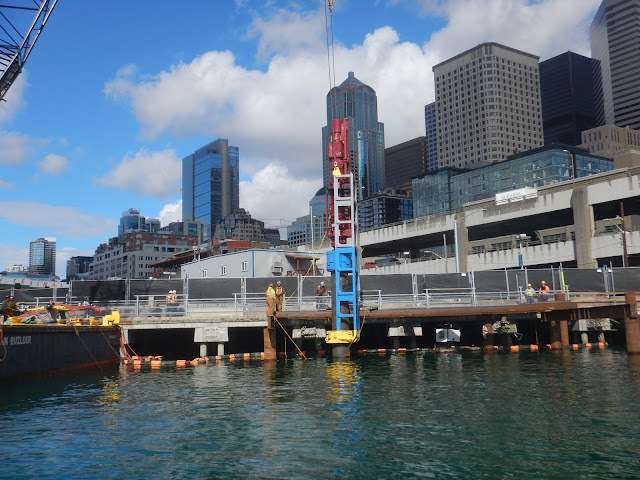 The first 138 feet of each new hollow steel pile is driven into Elliott Bay by a vibratory hammer. After that, an 11-ton hammer, powered by a 1,000 horsepower motor large enough to run a locomotive, is heaved to the top of a towering crane and sent barreling down on the pile repeatedly until the column is firmly embedded into Elliott Bay. This massive 11-ton hammer secures the pile in place below the mudline of Elliott Bay. The hammer is approximately the weight of two adult male orca whales. 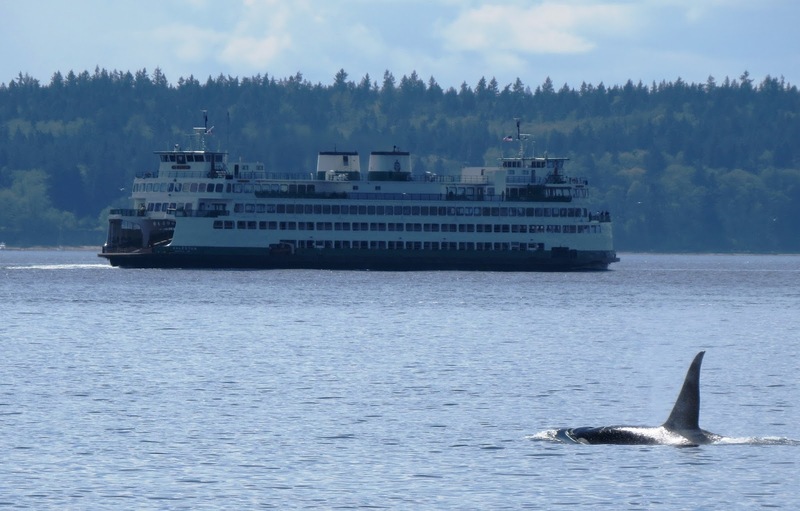 Speaking of whales, the project has several marine mammal spotters stationed on the ferry, up and down the waterfront and on Bainbridge Island. All pile driving activity temporarily shuts down when a spotter sees a whale or other endangered species making its way toward Colman Dock. We stop loud pile-driving work when endangered species are nearby. Recently our Assistant Secretary for Ferries Division Amy Scarton, Governor Jay Inslee, Rep. Judy Clibborn, King County Executive Dow Constantine and Bardow Lewis, Vice Chairman of The Suquamish Tribe, commemorated the start of pile-driving by signing one of the first support columns to be used on the project. This “special edition” steel pile will be installed later this month alongside 178 other piles that will make up the deck of the south trestle and part of the new terminal building. 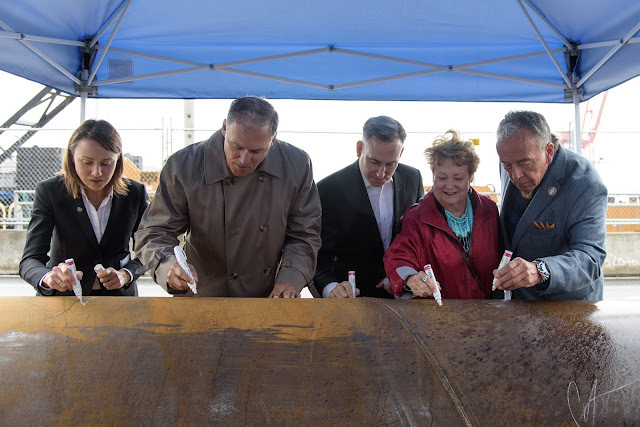 The deck is formed by filling up the top 12 feet of each embedded steel pile with concrete and connecting them together with pre-cut concrete panels. Pile-driving activity occurs during daylight hours, Monday through Friday (with occasional weekends) through February 2018. The work is timed to minimize disruption to our underwater neighbors, migrating and spawning salmon. 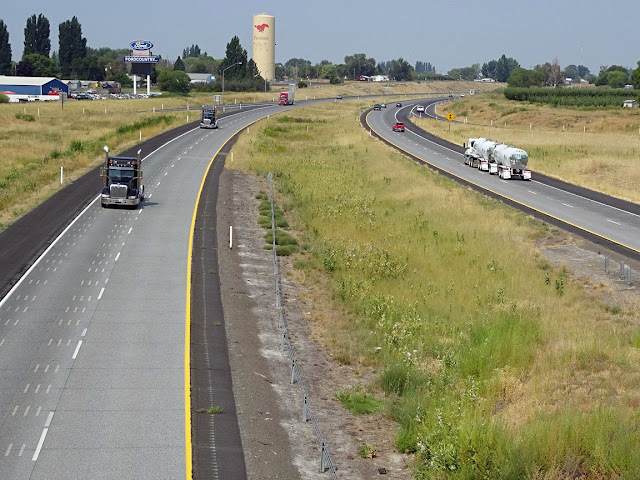 If you drove our highways this summer and early fall you likely got a first-hand glimpse at our pollinator-friendly mowing and planting policy – though it may be hard to recognize at first glance. 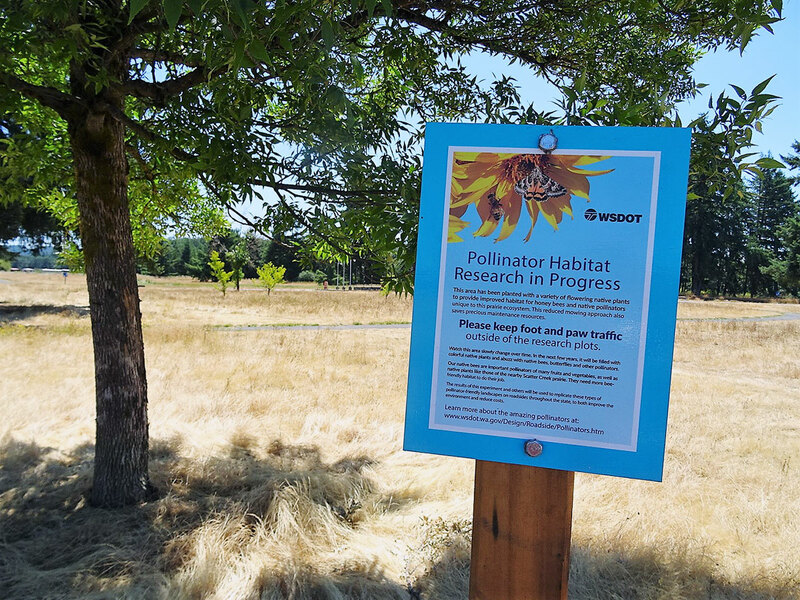 Signs like this at the Scatter Creek Safety Rest Area north of Centralia help explain our shift in mowing and planting to better support pollinators. In the next few years, this area will return to a more natural meadow instead of being mowed. About two years ago, we reduced the amount of mowing and weed removal in our wider right of ways to allow a more natural, meadow-like look to return. It's called integrated vegetation management and includes planting more native plants and using plants with staggered blooming seasons. This approach helps pollinators – animals and insects that transfer pollen from plant to plant – by providing more sources of nectar, pollen, larval host plants and nesting locations. (We still mow directly alongside roadways and other areas to maintain safe sightlines). Pollinators are crucial to plant reproduction and help support our state's $49 billion agricultural and food industry. In addition, reduced mowing helps save money (about $1 million annually) and reduces our carbon emissions (by 40 metric tons a year), which helps both human and pollinators alike breathe a little easier. The milkweed seen growing in the median along I-82 near Prosser used to be mowed, but now we're leaving it in place to provide habitat for monarch butterflies. This new mowing policy helps support important pollinators across our state. Milkweed along Interstate 82 through the Yakima Valley and Interstate 90 through the Ellensburg Valley. In years past, we saw it as just a weed and removed it. But now we know it's excellent food for Monarch butterflies. In just two years of reduced mowing a vibrant pollinator habitat has sprung up along the roadside. Fields in and around the Scatter Creek Safety Rest Area north of Centralia on Interstate 5. While it used to be mowed regularly, we're now letting native plants return. 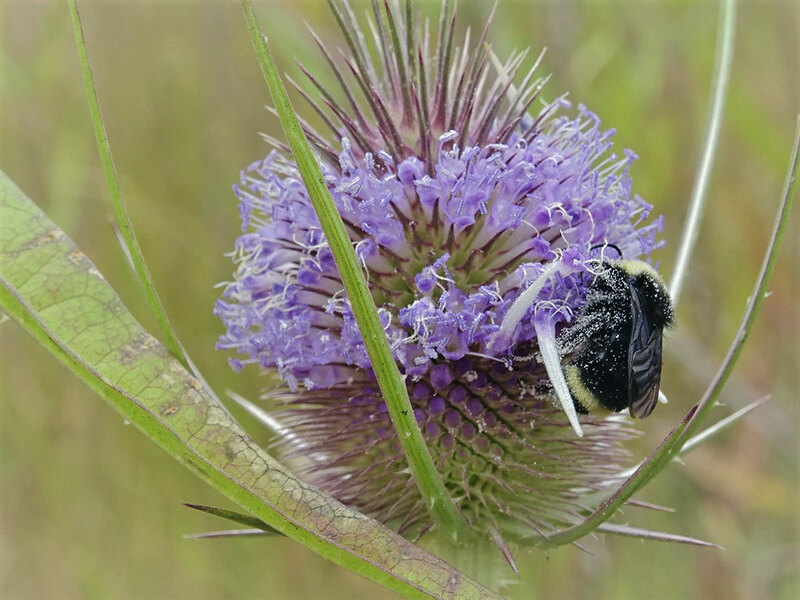 The emerging meadow helps provide pollinator habitat for honey bees and other native pollinators unique to the local ecosystem. Interpretive signs installed this summer help explain the ultimate goal and let travelers know to watch for signs of change during the next few years. We know some areas may look neglected while they transition from manicured to meadow-like, but what you're really seeing is our efforts to do our share and help improve the environment. So the next time you see some "weeds" along a roadway, look again, you might just see some butterflies or bees as well. Allowing pollinator-friendly plants in our right of ways help support pollinators like this bee, which in turn help support our state's $49 billion agricultural and food industry. The policy also saves money and reduces carbon emissions. We've all experienced those moments where you just need to take a photo. Many times, those moments are scenic. That's why we're pretty sure most locals and visitors to Western Washington have a picture or two of at least one of our ferries. Well, it's time to look in your albums or snap a fresh image because we're having a #FerryFotoContest on Twitter! We want a fantastic image to be on the cover of our printed Winter 2018 Sailing Schedule. It's your chance for thousands of people to see your best ferry shot! 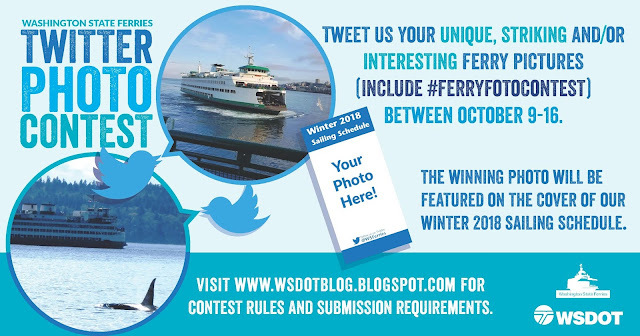 All you have to do is follow @wsferries on Twitter, then Tweet your picture between noon Monday, Oct. 9, and noon Monday, Oct. 16. Be sure to include the hashtag #FerryFotoContest. 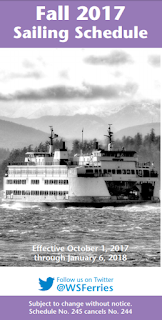 Must include at least one vessel in the Washington State Ferries system (in full or partial). Will be printed in black and white, so consider how that will look. Must have been taken yourself and you have the rights to submit it to this contest. May have been taken at any time. Do not break any laws or do anything unsafe in order to snap a shot. If you are on a ferry please steer clear of restricted areas, and if driving, please no photographing or Tweeting. Do not Tweet a link to an image that has been uploaded to another site. Do not send your photo via direct message on Twitter. You may submit up to three pictures. If you Tweet more than three, we will only consider the first three shared. You will retain rights to your photograph, however our five finalists must agree to grant us rights to use their snapshots for marketing and communication purposes, which will include photo credit. We will never sell your picture. Your photo will be displayed in black & white on our cover so consider that when submitting your entry. A panel of judges will select five finalists based on originality, technicality, composition, artistic merit and overall impact. The decision of the panel is subjective, final and cannot be appealed. 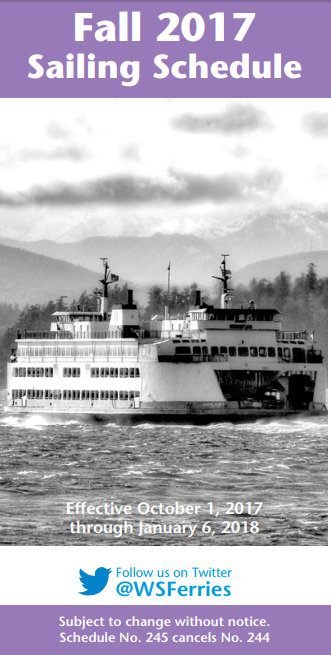 The finalists' pictures will be posted on the @wsferries Twitter page on Friday, Oct. 20. The image with the most "likes" at noon Monday, Oct. 30, will be named the winner. And we're pretty sure whoever that person is will have another one of those photo-worthy moments once we release our Winter 2018 Sailing Schedule brochure in December!